Jim Scotella was born in 1925 in Detroit, Michigan to parents who had immigrated to the US from Italy. His father joined the American Army in 1915, shortly after arriving in the States. He served in a field artillery unit in World War I. Unfortunately, Jim never learned much about his father’s time in the Great War. Many First World War veterans were reluctant to talk about their war experiences. They passed their stoicism on to their sons, the veterans of the Second World War, who also seldom spoke of their war time. Jim had a great childhood, but like in so many other families, money was tight during the Depression. When he was six-years-old, he and his seven-year-old brother sold newspapers on the street to help support his family. He learned to be street-wise navigating his Italian neighborhood. When he was twelve, he got his own paper route, and in 1941 when he was sixteen, he was hired by the Detroit Times to be a branch manager. 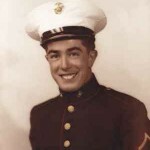 So many young men were joining the service at that time that openings were being created at the paper, and Jim was able to take advantage of the situation to move into a good office job. It didn’t hurt that he was also ambitious, hard-working, and smart. He did well. Despite the fact that he hadn’t finished high school yet,* when Jim turned eighteen, he decided to join the Marines with a neighbor. After they had their physicals, however, his neighbor didn’t make the cut. In fact, a lot of hopeful applicants didn’t have what it took to get into the elite corps. Jim found himself with just five others destined for the Marines. About another 300 ended up in other branches of the service, including his friend. Jim was transported to the Marine Corps Recruit Depot in San Diego for boot camp. Due to a medical emergency that put him in the hospital for over a week, he graduated with a new unit. That new unit (A41) ended up becoming a part of the 28th Regiment of the Fifth Marine Division. The Fifth trained at Camp Pendleton for about nine months, taking in veterans from Guadalcanal and Marine paratroopers, before shipping out to Camp Tarawa on Hawaii. Jim was assigned to Communications where he learned to encode and decode messages. He trained with the Navajo code talkers, as well as radio and signal men. In combat the Navajos had to be protected and shielded because their code talk was never broken by the Japanese. While they used a special version of their language to encode and decode messages, Jim learned how to use a cylinder to do the same. On the morning of the invasion on February 19, 1945, Fourth and Fifth Division men filled the Higgins landing boats, with the Third Division in reserve. Jim put on his pack and climbed down the rope ladder, being careful to grip the vertical sides of the rope to avoid getting his hands stepped on. Each Higgins boat held about 25-30 men. The water was calm, and as they moved toward the beach Jim had no fear. The tension started to increase as the landing ramp went down. Wounded were waiting to be transported back to the ship. Jim and his unit reached the beach, but sunk down to their knees in the lava sand. They had a tough time getting traction, taking a step up the first incline, and immediately sliding back down. It was a grind to get up the 15-20-foot hill, and then they had to cross another 100 yards of lava sand. After Jim crested the first hill, he saw an immobile Marine in an exposed position at the top of a mound. When he realized that the Marine was dead, the reality of combat sunk in. On a small island only seven miles long and five miles wide filled with thousands of landing Marines, the Japanese could lob anything over and be sure of hitting someone. Jim just tried to get as close to the base of Suribachi as he could. Once he and his unit reached Suribachi, they dug in. The next morning, Jim and some of his unit returned to the beach to pick up batteries for the radios. A couple of close friends stayed back. There was still a lot of firing at that point; the men were always a target. It didn’t matter where they were on the island, nobody, even officers, was safe. When Jim and the others came back to their positions, they found a mortar had hit their foxhole while they were gone. One friend was killed and another had his arm nearly torn off. On the second night another of his friends, Ray, took a message instead of Jim, and while doing so got hit. Jim finished taking the message and made sure it was delivered, and Ray was sent to the hospital ship. Ray survived the war and died in 2011. On the fourth day there, Jim saw the flag go up on Suribachi. He and the others cheered and yelled. It was an especially meaningful and inspiring moment in a tough battle that continued on for weeks. Two weeks in, the Marines discovered that the Japanese had miles of sophisticated tunnels throughout the entire island. Many Marines went into an area they thought had been secured, including pillboxes, only to be killed when Japanese infiltrated from underground. Jim was there when one of his friends, Iggy, who had been captured, tortured, and killed by Japanese in tunnels, was discovered naked and mutilated in a cave. The tunnels were so well camouflaged, no one knows where he was taken down. Knowing that you could be hit from above the ground or snatched from below it into a hellish death anytime only increased the nightmare for these brave young men. Eventually, after 26 days of hard fighting on the island, the frontline rifle squads needed replacements, and some were drawn from Communications. One of Jim’s friends literally drew the short straw, and was sent to up front. He wound up dead shortly thereafter. .
Jim was extremely fortunate throughout whole campaign, but many were not. There were 19,000 American wounded and 6,138 killed on Iwo Jima, the bloodiest battle of the Pacific. The great accomplishment of this tremendous sacrifice was that over 2,000 airmen lived because the crucial airfields on the island were now in American hands. Iwo Jima’s key strategic location was desperately needed for bombers and fighters who were attacking mainland Japan. Iwo Jima brought Americans one step closer to the heart of the Japanese empire. When Jim came back he decided not to go to college, but to return to his good job at the Detroit Times, where he by then had five years of seniority. Later he moved to California, working for papers in Los Angeles, and then became a successful entrepreneur. Now he spends his time investing in the stock market and enjoying retirement with the girl he married when he got back from the war. *Jim did receive his high-school diploma while in the Marines.